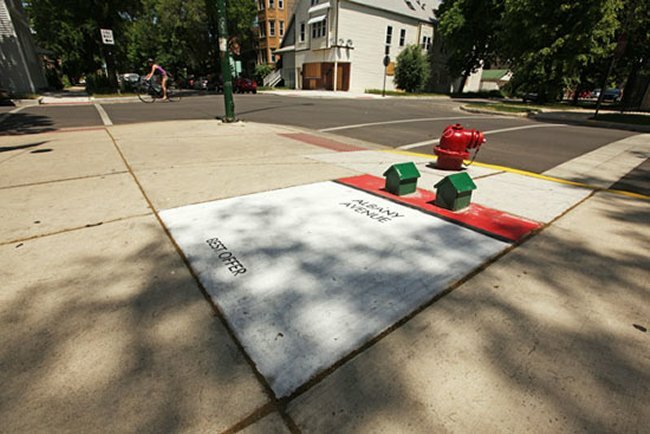 A group of artists who go by the name of “Bored” (Or maybe just a lone guy) have set up life sized sculptures and pavement art in Chicago’s Logan Square neighborhood, creating a life-sized game of Monopoly. I hope that doesn’t mean that you go to the actual jail when you land on that space. They created dice, Community Chest cards, houses and of course property tiles. Most of the pieces can be picked up and moved and have funny messages hidden on them. The artist or artists want to remain anonymous. This is the kind of geeky art that I love. This art has assaulted the street and who knows what it will evolve into from there. Maybe someone will create other life-sized board games on the street that are playable.